Weighing in, Commissioner Bud Selig said he is keeping a close eye on Ramirez's candidacy. "I'm going to think about that," Selig said. "He doesn't come back till July 3. Normally, I'm sensitive to the wishes of the fans. If the fans choose someone, I'd like to honor that. But we've been testing players for a long time, and it bothers me that someone would [cheat] at this stage in the game. I've got some time to think about this one." "While we recognize the current CBA allows for players who have tested positive for PED's will be eligible for the All Star Game and any seasonal awards, we are requesting a meeting with the leaders of the MLBPA after the season ends. We hope that we can agree to amend the CBA so that the spirit of the game matches the rules of the game." Whoever you vote for, whatever the reason, at least go vote. I'm still lobbying for Manny to keep the dialogue going about the lack of a "Shawne Merriman rule" and the conflicts with the selection process and a game that counts. But go make your voice heard! I'm an Astros fan but i would love to see Manny in the 2009 All-star game. I don't care if he did or didn't use steriods. I love to see homeruns and so do you thats why we go to the game, right ? 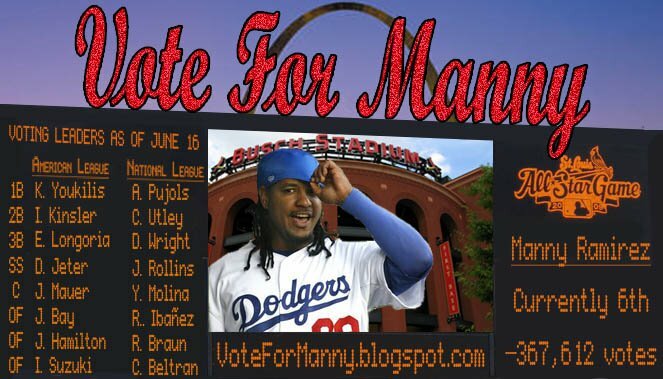 Now quit the complaining and go Vote for Manny, I did.